At the same time, high-quality images and video can be a major challenge for site owners and developers who need to dynamically generate large volumes of images, store them, optimize them for quality and performance, and deliver them to users around the world in an instant. As a developer, there’s no doubt you want to stay on the cutting-edge of new techniques and best practices for image and video management. You may want to know how to address particular challenges, such as the best way to achieve a desired effect, how to find a balance between image quality and site speed, or how to upload multiple images to different platforms. But often, you may have to bounce between sites and forums to find answers to your questions. That’s why Cloudinary created The Visual Web. This online community is designed as a one-stop resource where you can discover what’s new in image and video management, and how to apply it to your own projects. Here you can learn more about various image and video formats, optimization, delivery, storage techniques, and best practices for media manipulation and adjustment for websites. This Visual Web is a collaborative knowledge base that maps out the image and rich media management landscape. The site includes a carefully curated index of thousands of resources on a wide range of image, media and web development topics, written by leading bloggers, developers and technology experts. 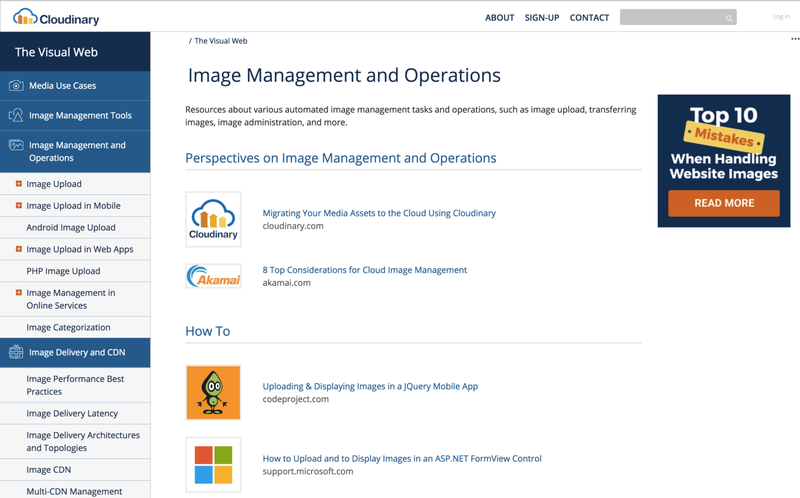 Cloudinary took on this project to make the available content about media management easily accessible. The site started with an intensive research project – the first stage was building a tree of more than 300 sub-topics around image and video management, including media use cases, media management and operations, image delivery and content delivery networks (CDNs), image and video manipulation techniques and video formats and transcoding. The Cloudinary team collected more than 100,000 web pages that cover these subjects, hand-picked the most relevant ones for each category, and divided them into “content types,” such as “how to” articles, real-life examples, vendor information and product comparisons. The site currently includes about 70 pages of content and is growing fast! If you feel we left something out, let us know and we’ll add it to the list of resources. Explore, learn and kindly spread the word!